Scammers are everywhere and they prey on targets of opportunity. Unfortunately, the unsuspecting and often naive senior citizen is the one most often targeted and vulnerable. Due to their cognitive problems and impaired judgment, isolation and sometimes loneliness, seniors are often dangerously trusting. The good news is that seniors who are aware of the latest scams are more likely to take caution and not be tricked if they are targeted. By being forewarned, they can be weary of solicitors either via phone or at their door and they can be vigilant about warning their senior friends and loved ones. The following are a few of the latest scams that are often used to try to separate seniors from their money. The Grandparents Scam: This scam is when a senior is called on the phone by someone claiming to be their grandchild needing financial help. The imposter usually acts distressed. They will call and say, “Hi Grandma, do you know who this is?” From there, the unsuspecting grandparent will guess which one of their grandchildren the person on the other end of the phone sounds like. The scammer has established their fake identity without having to do any type of research or background work. The scammer will claim to need money for college books, rent, bail or something serious and ask that the money be sent Western Union. Tips to Avoid This: If a suspicious call is received, the Senior should always tell the person on the other end that they need to call them back. From there, they can call the relative or loved one and make sure the story checks out. It’s important to understand that the scammers can use social media to get information so it’s important not to be fooled even if a suspicious caller references details about relatives. Email Scams: Perhaps one of the most popular types of scams, the email scam is a type of investment scam because these emails typically claim to be from a well-connected and rich individual that claims to give you a cut of their fortune as long as you can offer a little assistance first. Often known as the “Nigerian email scams” (although the email is not always originating from Nigeria) these emails try to convince recipients that they will be given if a fortune, but end up spending one instead. Victims will end up sending multiple payments in hopes to get a huge payout. There are many types of email scams because email is one of the most effective mediums to lure in unsuspecting victims. Scammers use online tools and typically operate from outside the United States. Tips to Avoid This: The best way to not be scammed by an email imposter is to be inherently distrustful of unsolicited emails. Seniors should also avoid disclosing private information online at all costs. Anyone who has a question should call the organization or individual directly and not correspond back and forth via email. Medicare Card and Medicaid Card ID Theft Scam: This one is scary because it can often seem extremely ligament. This scam involves imposter Medicare Card Callers claiming to represent various government agencies or organizations and try to convince seniors that their Medicare or Medicaid cards needs to be renewed or replaced. Of course, this is merely a trick to get seniors to disclose personal information resulting in identity theft. Tips to Avoid This: Personal banking information and social security numbers should never be given over the phone. Also, seniors should always be suspicious of anyone who claims to be from an official agency and then requests personal information. Charity Scams: In the wake of major disasters –locally and nationally – callers will claim to represent various charities supporting the disaster recovery. They will ask victims for money as a donation. Of course the money then goes directly to the criminal’s bank account. Sometimes the scammers will even send emails soliciting donations. How to Avoid This: Any senior citizen interested in supporting a charity should seek them out themselves rather than respond to someone calling over the phone or via email. Never make a donation to an organization that cold calls. These are just a few of the major scams currently affecting senior citizens. There are many more out there that should be avoided. Loved ones should always notify their beloved senior family members whenever they hear of a new scam. 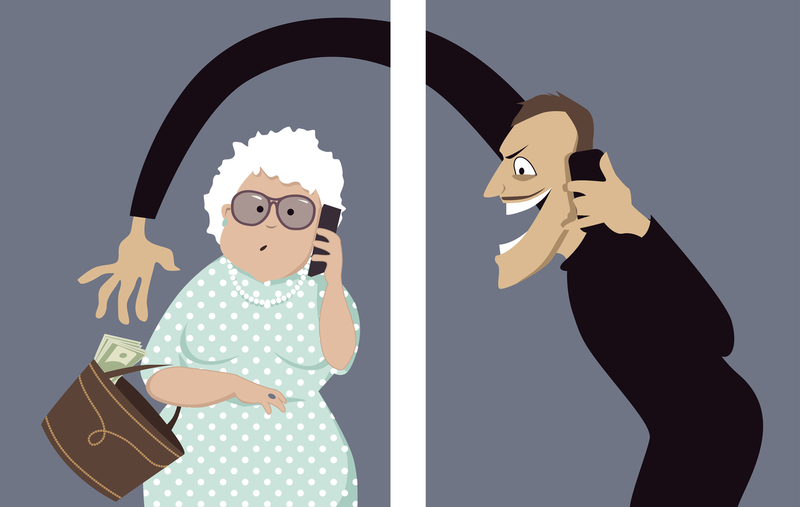 By being forewarned and informed seniors will be less likely to fall victim to con artists. As a Home Care Agency or Nursing Home, there’s no doubt that you have a deep interest in the wellbeing of senior citizens. From keeping them safe from scammers to protecting them from falls and illnesses, if you’re ready to reach your prospective patients and their families, there’s no better way then with SSMPAS.com. Everyone from patients and families to you and your business will benefit. Plus, Assisted Living Facilities and Homecare Agencies that advertise with us get their own webpage. Even before you sign up you can see that we are significantly worth it because you get so much more with us. Get started with SSMPAS.com today!